..and street food in particular has its own charm. It acts as a tiny window to understand and get a taste of local favorites. 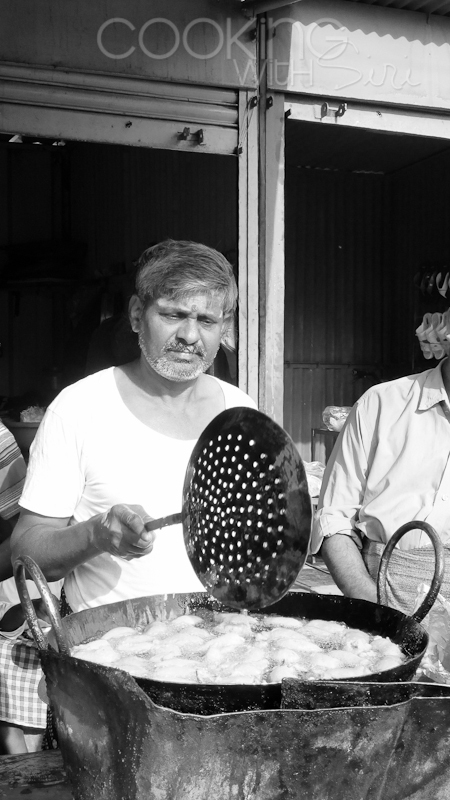 Here is a vendor making hot mirchi bhajias (fritters), perfect for the rainy weather we are experiencing in Hyderabad. Here for my mother's version of the recipe. Don't forget to cut some onions on the side and sprinkle some chaat masala on the top! 4 days left for two special anniversary giveaways open for readers through out the world. Click here for more details . Beautifully clicked. Liked your Amma's version of double fried cut chilli fritters. The best way to relish roadside snack is to send someone less finicky to get it. If I were to go personally I would do a survey and then come away without buying them.. for reasons galore. And what could be better than a plate of bajjis on a wet rainy afternoon! Great shot. How I wish that we had roadside vendors like this here! Your mother's bajji look very similar to the onion and/or chili pakoras we have made in the past (and thank you for the reminder to have them again!). But we don't put baking soda in our batter. We'll have to try that. Very nice, Siri. I like his gesture and expression.